Free Shipping for $50 and above! We create camping gear designed to stand up to the rigors of windy days, rainy nights and the wear and tear that comes with outdoor survival, summer festivals or any amazing adventure. With its lightweight, spacious design and 400-pound capacity, it’s the camping companion you can’t go without. Setup is a breeze with the included steel carabiners, rope and tree friendly straps. You’ll be blown away by just how simple it is. Whether you’re ready for a good time at a festival or a peaceful evening on a pristine beach, our parachute hammock can go anywhere you go. There’s plenty of room for two, and the military-grade 210T nylon fabric makes both a durable and comfortable bed. And we mean COMFORTABLE. You’ll find that not only is it ultra-light, but it’s sturdy and rugged enough to outlast any environment. Take it with you on any adventure. Give your husband, your wife, or your kids this quality hammock for a unique gift they will surely love! It’s the perfect white elephant exchange gift too! It's very comfy to sleep on, and the weight distribution keeps your hip or shoulder from touching the ground when you lie on your side, which is great because I'm a side sleeper. The material seems very durable. I bought Legit Camping’s hammock and I was very happy with it. 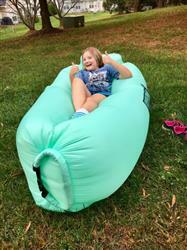 I saw a lounger at a festival and thought they were a really cool idea. This lounger meets my expectations on quality, build and just how compact it is. So far, I’ve only tested it out indoors, so I’ll give it 4 stars for now until I have more time to fully test this product. I enjoyed the comfort level lying on it, and it definitely gives you the ability to have something to sit or lounge on almost anywhere you go. Two thumbs up! We use it about every weekend and it holds up amazingly. We've had it for a year now and it has no leaks. It stays inflaeted for days without any sign of it deflating. I bought this after trying out their hammock, and I am very pleased with my purchase. The lounger is pretty easy to inflate, which I was surprised with. 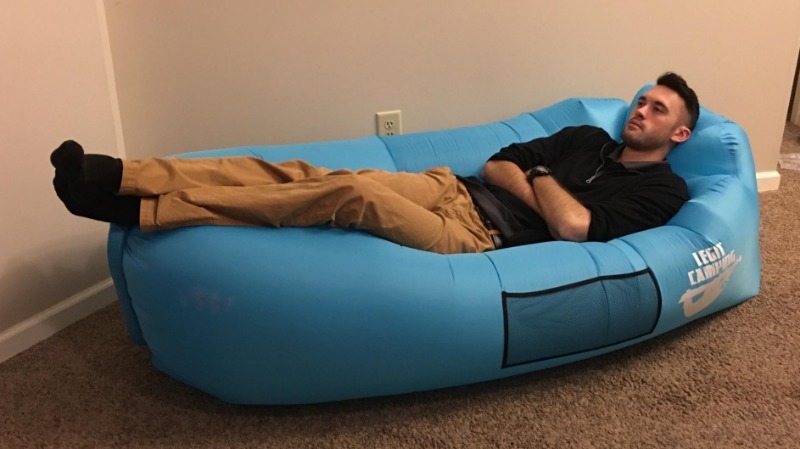 One of my main concerns was its capability to hold air, but after sitting in it for about four hours w/o any air loss, I am confident that it's not an issue I need to be worries about. I was also concerned with how well I would fit in it, but even at 6'5" I was able to fit very comfortably. The only downside was that the bag provided to store it is a little small so it takes a little bit of practice to get it into storage. This Lounger is truly Legit! Your Personal Camping Equipment Store!